A Thermal Heat Store is an advanced central heating method. It’s a place to store heat from solar panels, boilers, log burners etc. and is starting to take hold because they reduce the need to buy expensive fossil fuels to meet hot water demands. At Buxton Heating, we are constantly striving to find better central heating solutions. One way is to combine several different heat sources. This can be brought together with a thermal heat store or thermal store. This will allow any heat generated in the home to be stored and then used for central heating or hot water when required. Thermal Heat Stores also allow you to manage the difference in time between when heat is available and when it is required. Therefore, hot water produced by solar heating systems during the day can be stored for use when solar energy otherwise isn’t available. 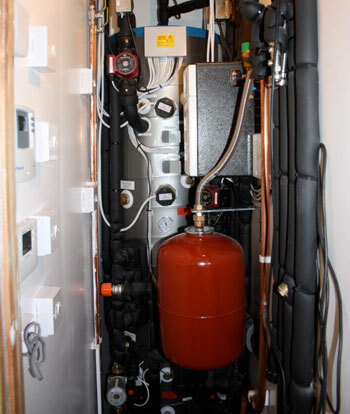 This cost effective and sustainable way of hot water generation, reducing utility bills and your carbon footprint, is fast becoming a popular choice for homeowners. We will advise, design, specify and install Thermal Heat Stores in Haslemere and the surrounding areas and are happy to show you the effectiveness of a working installation.